Popcorn - Machines & Supplies - Cambridge Nostalgia & Co. - Retro Furniture, Gas Pumps, Games & More! 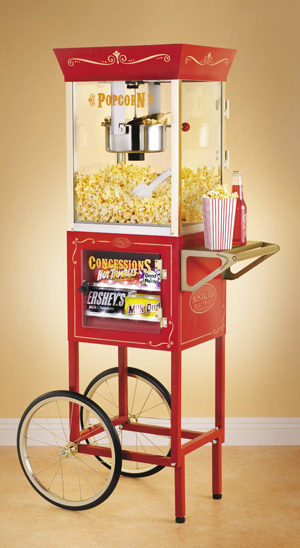 We carry a large selection of popcorn machines for every occassion. Whether you are looking for something to finish off your kitchen, rec room, basement or need one for your church or school, Cambridge Nostalgia & Co. can help. Inspired by the art deco architecture of the late 1920’s and 1930’s, these popcorn machines are ideal for home theaters. 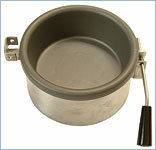 The inner kettle is constructed of thick gauge anodized aluminum for maximum performance and easy cleaning. Aluminum provides the best heat transfer of any “cookware approved” alloy while the 20 mil thick anodizing armors the kettle for durability and provides a super-slick surface for easy cleaning. 50 watt heating element in the base to keep popped corn fresh and warm. Perforations in the bottom aluminum tray allow the un-popped kernels to fall int the drawer leaving only fresh and fully popped corn in the holding bin. From the boardwalks of Coney Island and Palisades Park these antique styled popcorn machines will remind you of an era when vendors sold popcorn on street corners all across America. Sure to create a fun and friendly atmosphere in any location! 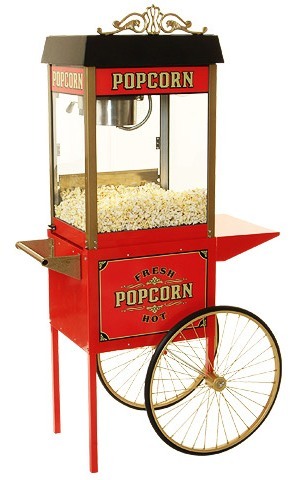 Providing a vintage look and feel, reminiscent of silent movie houses and carnivals circa-early 1900s, the Old Fashioned Movie Time Popcorn Cart with Concession Stand is designed for both home and commercial use. Pops up to 24 cups of hot, fresh, kettle cooked popcorn per batch. Large, stainless steel kettle with a built-in stirring system. Kernel catcher to keep unpopped kernels out of each perfect batch. A compartment in the base of the unit to store supplies, making it easy to keep the cart well stocked and organized. The other side of the base features a concession stand with three illuminated shelves to hold a variety of treats. This popcorn cart looks and feel just like the ones you would find in the movie houses and carnivals of the late 1800's to early 1900's. 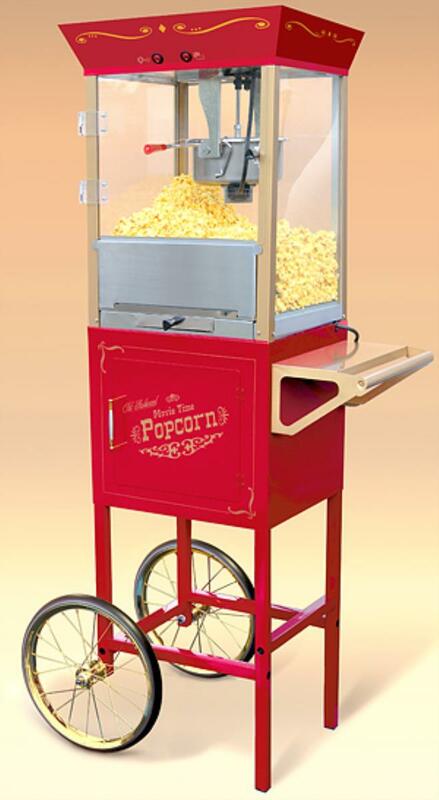 The 59" height of the Movie Time popcorn cart is perfect for making hot, fresh, theater style popcorn, right in your own home! A built-in stirring system ensures a perfectly cooked batch every time. Brings a vintage vibe to your home, making it the hit of any party. Comes with an Old-Maid drawer that catches unpopped kernels. Each batch produces 2 quarts of hot, fresh kettle-cooked popcorn. The kettle is constructed of stainless steel for durability. Approved for Home and Commercial use. Handy cupboard for storing all of your popcorn supplies, including the scoops that come with the machine! We are constantly working to update our website. If there is anything you are looking for but can't find it here, please don't hesitate to contact us by phone at 519.740.6367, email us at: info@nostalgiaco.com or stop by the store!